The Bills marched into New Jersey with a quarterback they signed 12 days ago and blew out the Jets 41-10 in the type of game that will probably result in Todd Bowles getting fired tomorrow. The best offensive output of the season, which included the best performance by a Bills quarterback this year helped the Bills improve to 3-7 as they head into their bye week. Let’s dive into the highs and lows. Where else could we start? How impressive was Barkley today? Six practices to learn the playbook and quite honestly, he was better than any Bills quarterback to suite up this year, and yes, that includes future franchise quarterback Josh Allen. Barkley threw for 232 on just 15 completions, averaging 15 yards per throw. 2 TD’s and 0 INT’s later and you are probably looking at your new backup quarterback. Barkley’s deep throw’s were accurate, he also threw a beautiful would-be touchdown to Benjamin that was dropped (stop me if you have heard that before). He deserves all the credit in the world for this game today against a very good Jets defense, even though they did not have their best day today. I am giving Sean McDermott a high for realizing that he could not go back to Nathan Peterman to start another game this season. Some of Peterman’s performance was due to bad luck, but the majority of it is because he shouldn’t be on the field right now. Until this week, Sean McDermott had unwavering faith in Peterman as a starting quarterback, and he finally made the bold decision to start a player with 12 days of experience in the system instead of Peterman. It was a bold choice, but the right choice. This game was a long time coming for McCoy. Right from the his first rush of the game, which was a 28 yard touchdown run, you could almost hear him exhale through the TV. It was his first touchdown of the year. Incredible that a player of McCoy’s caliber doesn’t get his first TD until Week 10, that stat tells you how bad this offense has been this year. McCoy finished with 113 yards on the ground and 2 TD’s, his first game with over 100 yards since the Snowvertime game last December. McCoy seemed more decisive today, he took the rushing lanes that were available for him. He has been frustrated as of late, today will help alleviate that frustration level. Deonte Thompson was the last Bills wide receiver with 100 receiving yards in a game. That changed today thanks to Robert Foster. 3 catches for 105 yards put an end to that streak for the Bills today, which lasted over 1 calendar year. A crazy stat! Sticking with wide receivers, the best statistical game of Zay Jones’ career was today, as he finished with 8 receptions for 93 yards and 1 TD. One thing that I do enjoy about Daboll’s offensive is how they are using Jones within the offense, especially the patterns that they are running with him. His development is one of the only bright spots of the season at this point. If this was any other team in the league I would not give this OL’s performance today a high, as they still were blown up on a few run and pass plays. But lucky for them, this unit has been so bad this year we are grading them on a curve! By their standards, they played great. Wyatt Teller really did make a difference out there and Dion Dawkins even caught a touchdown pass! Overall, I was impressed with this unit based on the fact that the team had 212 rushing yards today and 451 total yards. Great job to this unit, Juan Castillo and all involved! How often does it happen that your offense has 451 total yards and your #1 receiver has a grand total of 0 of them? Well that happened today. He did show up for his usual drop in the endzone on a perfectly thrown ball, though. Oh…and on the Bills 2nd half touchdown drive you could see him asking Zay Jones the play and where to line up again. So yeah, just another day at the office for Kelvin Benjamin. Poor guy, even when he doesn’t play he is going to take an L. Peterman’s fate was pretty much sealed when McDermott decided to start a quarterback signed off of the street over him. Well, his fate was certainly sealed after how Barkley played today. I can almost guarantee they will sign him back onto the practice squad, but I would think Peterman-on-the-active-roster era will probably be coming to an end this week. I know I’m getting nit-picky here, but I’m going to do it anyway. Going into the second half today I was a little worried we were going to see a repeat of the Minnesota game, where the offense slept through the entire final 30 minutes. While that didn’t exactly happen today, there were some similarities between the two games. Outside of a 3rd & 20 bomb to Foster, the Bills probably wouldn’t have scored a TD in the second half. I understand game plans change when you are up by 30, but you’d still like to see them drive the field the same way they did in the 1st half. The last time those two teams met on that field it was a beat down, just in the opposite direction. It seems like forever ago since the Bills offense put up 451 yards of total offense. Who cares that they needed their 4th QB in 10 games to do it. For today, Matt Barkley is the man of the hour. With playoffs out of the picture, the Bills will play for progress, growth, and learning, hoping to grow on whatever the heck today was. Now, the Bills get to rest up and waiting for them on the other side of the bye is Saint Doug Marrone. Oh, and Josh Allen is back. All of a sudden he has very big shoes to fill. Praying for you Pancho! Viva Los Bills!! If you haven’t yet, watch his emotional speech he gave to the team last night. Clearly, they took it to heart and played with a little extra motivation today. 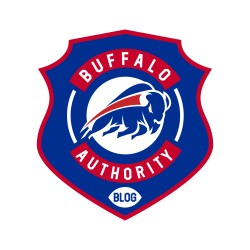 This entry was posted in Analysis, Game Reactions and tagged Bills, Bills Blog, Bills vs Jets, Buffalo Authority, Buffalo Authority Blog, Buffalo Bills, Buffalo Bills Blog. Bookmark the permalink.